When I enter sculpt mode half of my model goes missing? When I enter Object mode, both sides of my model shows. However, when I enter Sculpt Mode only half of my character shows up. This makes it difficult to sculpt without seeing both sides. i have put one mirror and one multiresolution modifier on my model that I have just made. I have clicked subdivide twice and would like to start sculpting. I'm new to blender, so I believe the fix may be simple like I forgot to hit a key or something? Any ideas on how to fix this? Any help appreciated. Thank you for your time. This means that while it can be only in the top of stack relatively to other modifiers generating geometry Sculpt mode will take into account only data generated by Multires, all others (especially generator modifiers, like Mirror) will be skipped. 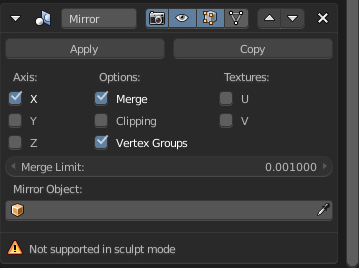 So in order to have all mesh faces available for sculpting while in Sculpt mode with Multiresolution apply Mirror modifier and edit mesh with X-Mirror option (in Edit mode) or Toolshelf > Tools > Symmetry/Lock (in Sculpt mode) instead. Not the answer you're looking for? Browse other questions tagged modeling sculpting mirror multiresolution or ask your own question. Vertex out of position in sculpt mode! Problem with Sculpting Objects That have been joined together? How to un-mirror an objects sides?